*** Gigs #339 booked ! *** Gigs #338 booked ! *** Gigs #337 booked ! *** Gigs #334 thru 336 booked ! *** Gigs #333 booked ! *** Gigs #330 thru 332 booked ! *** Gigs #328 thru 329 booked ! *** Gigs #327 booked ! *** Gigs #324 thru 326 booked ! *** Gigs #322 thru 323 booked ! *** Gigs #316 thru 321 booked ! *** Gigs #312 thru 315 booked ! *** Gigs #310 and 311 booked ! *** Gig #309 booked ! *** Gig #305 booked ! *** Gig #303 booked ! *** Gig #300 booked ! *** Looking forward to our debut at The Tin Pan ! March 17, 2018 - Tickets on SALE now! *** Gig # 298 booked - 2 more to go to the 300th performance of The Mike Lucci Band ! *** FOUR new gigs added to the performance schedule! - 2 GIGS at The Iron Horse in Ashland VA, 1 gig at Midnight Brewery in Rockville, VA, and a PRIVATE PARTY in Nelson County, VA.
*** Our calendar is filling up fast! We just confirmed two gigs at the TRIANGLE in Williamsburg, VA, - July 21 and October 5 2018. Showtimes are 8:00 pm. See our performance schedule for details. We’d like to thanks all of the venues that have booked us in 2017 and continue to book us in 2018. We, and our fans, appreciate the opportunities that you have provided us to share our style of Chicago Rhythm and Blues. We wish you all the best in 2018 ! Bookings continue through 2018; we recently book gig #290! Please feel free to contact me at mjlucci@gmail.com or my cell at 804-814-4298 to book the band at your venue or private party. Be sure to check out our Performance Schedule and Band Gig Map to see where we’ll be and the places we’ve performed. Booking continue through 2017; we only have a few (may 2 or 3 dates) available for booking in 2017. We are taking bookings for Jan 2018 already! To date; we have booked our 276th gig!. The band celebrated our 250th Gig at Legend Brewery. We promoted our limited edition shot glasses commorating the event. Our GiG Schedule is getting filled FAST! We just confirmed two gigs at Croakers Spot in Petersburg, VA for June 24th and July 29th 2016. Update your calendars! Also be sure to check all of our dates within the “Performance Schedule” tab. The Mike Lucci Band would like to thank Cogan's Deli and Sports Pub for hosting us on Friday Night and Daddyo's Tavern for hosting us on Saturday Night. We had two great performances this weekend that had the dance floors filled. Our performances included the outstanding talents of our friends who sat in with us during our shows. The fine showmanship and harp playing from Bobby Blackhat, solid hair raising blues keyboard from Frank Brewer, and the sultry tones from saxophonist Chuck Maranzano. A big shout out to all of our fans and patrons of these fine establishments. Thank You for supporting live music in the Williamsburg area. We appreciate all of your kinds words and enthusiasm for our style of the Blues and hope you enjoy the CD's that you all purchased. Keep track of our future shows at www.mikelucciband.com. Looking forward to seeing you all soon ! Cool temperatures and rainy conditions did not dampen the enthusiasm or the number of participants for the Connects Federal Credit Union Corporate 4 Miler held Thursday, June 4 in Innsbrook. We had a great time playing a very upbeat set for all the runners. It was so fantastic to watch them cheer for us as we played and cheered for them as they ran by. Runners of all levels participated making for a constant flow of folks passing by our location. There was no time for breaks as we forged ahead through our song selection and enjoyed watching everyone jog-dance past us. Yes, Jog-dancing is a very real thing! Many thanks to Sportsbackers RVA and Connects Federal Credit Union for including us in this year's event. We'd come back and play for you anytime! Thanks to everyone that came out to Cogan's Deli and Sports Bar on Friday April 24th ! It was great to see so many of you come out and stay out. You filled up the room and we loved playing for you. The performance was one of our best as we unveiled the three newest songs we've been working on. We're so glad you enjoyed them. Next up on the calendar is a trip to northern Virginia as The Mike Lucci Band will be playing The 219 Basin Street Lounge for a special Sunday performance on May 3rd. Showtime is 8:30 pm. We’re looking forward to performing in Alexandria, Va.
Keep in touch and we'll look forward to seeing you soon at a venue near you. The Beacon Theatre - July 18, 2015 - Ticket information will be provided in May 2015. The latest event on our calendar brought us to Manhattan's Deli in Newport News to host a Brews and Blues jam. There were lots of great musicians that brought in their instruments and their talents. Old friends like Bobby Blackhat helped keep the action going. Always nice to share the stage with him. The crowd enthusiastically embraced and responded to our music. The Mike Lucci Band was truly well received. We'll look forward to a return engagement as soon as one can be arranged. We want to thank everyone that came out and filled up Rose Marie Inn last night (Friday - Mar 6). It was the first time we'd ever seen the room filled to capacity. Standing Room Only! Speaking of the Universe.... The best bar in the Universe (affectionately known to one and all as Rose Marie Inn) did a wonderful job of keeping the food coming out of the kitchen and the drinks coming across the bar. Special thanks to Noelle for taking such great care of us and all of our friends last night! Many thanks to Johnny and Mary Woedel for setting it all up. Be sure to check back frequently on the Facebook page as well as our website (www.mikelucciband.com). We'll be posting some pictures very soon. It was such a fun evening we had to capture the action on film (disc). Look closely. You might even see yourself dancing to the music. On behalf of all of us in The Mike Lucci Band, we'd like to thank everyone who has so recently "Liked" our band FB page. Welcome! Please visit often and check out (www.facebook.com/pages/Mike-Lucci-Band/91812660980) for upcoming shows and events. We'll look forward to seeing you soon! Up next is our return to Rose Marie Inn at 8923 Patterson Avenue. This Friday, March 6th. It’s in the west end of Henrico County just west of the intersection of Parham Road with Patterson Avenue. Please check out our page on Facebook as well as our Performance Schedule on our website (www.mikelucciband.com) for any and all details. It’s an early show that starts on the downbeat of 8:30 p.m. We’ll be serving up Chicago Styled Blues spicy and hot. The party will be going on til 11:30 p.m. Come on out and see us and be sure to welcome our newest (official announcement was recently released) member Mark Saurs. Mark has been playing with us since August and we’re glad to welcome him on board. 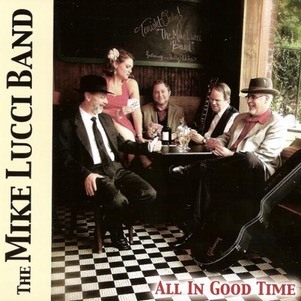 The Tidewater area loves the Mike Lucci Band (and who can blame them). After many successful dates at Cogan’s Deli and Sports bar as well as a stunning performance at the Williamsburg Blues and Jazz Festival we have been invited to play at Manhattan’s NY Deli and Pub in Newport News. We’ll be there on Sunday March 15. For all of our Tidewater fans - as well as any of you travelling in the area that weekend – it’ll be an early show. We’ll be starting at 3 p.m. and our show will include performances by some of our favorite musicians from the area. It’s gonna be a special afternoon and early evening. Mark your calendars now and plan on joining us for the party. The Mike Lucci Band announces the retirement of guitarist, vocalist, and song writer Ron Winston. Ron Winston has decided to retire as guitarist from The Mike Lucci Band as he nurtures a back ailment. Ron has been an integral part of the band from its inception back in early 2008. Over the past 7 years, styling on either his Gibson Custom Signature BB King Lucille, Gretsch 5422 or his Gibson SG Standard, Ron has guided us through over 150 gigs, 10 local IBC Competitions and two quarter final performances at the International Blues Competitions in Memphis, Tenn. (2011 and 2013). Ron is known for his tasteful and powerful leads, flowing rhythms, and down right Chicago style feeling of the blues on guitar and through his voice. This creativity especially shines in his two original songs featured on our album “All In Good Time”. 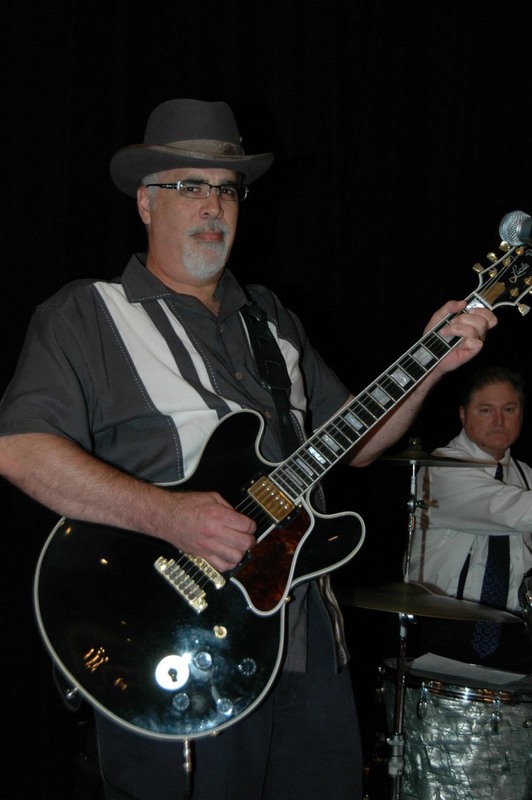 Ron is a co-founder of The Mike Lucci Band and has also co-founded Sugar Daddy and the Two Dollar Blues Band. Ron has been performing on stage with Mike since 1999. We will miss Ron onstage and all wish him a speedy recovery. With Ron’s announcement, Mark Saurs has offered to take the permanent role as lead / rhythm guitarist and vocalist for The Mike Lucci Band. We are honored to have Mark onboard as he has been sitting in with us since Aug 2014. Mark is well known in the blues community all along the East Coast from north of D.C. to North Carolina. Mark brings with him over 40 years of musical experience. 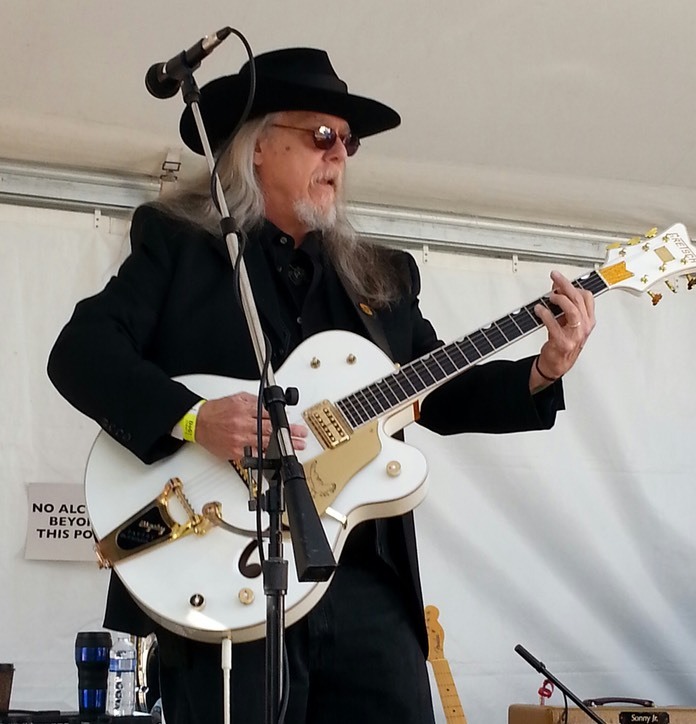 Mark was inducted into the Northern Virginia Blues Society Blues Hall Of Fame in 2012. Welcome Aboard Mark ! Supporting the Tad Dupriest Foundation’s “Making a Difference in May” event. More information about the foundation can be found at www.taddupriest.org. McCook's Sports Bar and Grill - 17 January 2014 - 8:30 PM till we close the place !!! 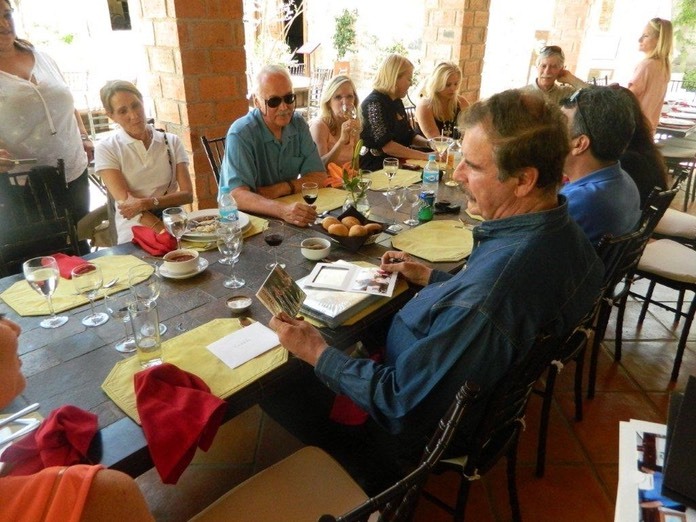 Former Mexican President Vicente Fox holding The Mike Lucci Band's CD - "All In Good Time" presented to him by Shelly's Dad. President Fox loves American Blues ! Marty's Grill in Mechanicsville, VA - 14 September, 26 October, and 14 December 2013 - 9pm til ? Democracy Vineyards - 20 July 2013 - 2:30 ish pm - ? Check out our first album review !!! Proceeds benefit the REESESTRONG FOUNDATION- Dedicated to helping families Stay Strong in the battle aginst Childhood Cancer. CD Sales and T-Shirts are going very well !! The Band is rehearsing the songs that we will be performing at the International Blues Competition in a few weeks. · Any of our upcoming gigs. · By contacting The Mike Lucci Band via the "Contact" page.